The Rolex Kentucky Three-Day Event happens every April in Lexington, and in 2015 brought more than 75,000 fans from North America and around the globe to the Kentucky Horse Park over four days. Known as “The Best Weekend All Year,” the Rolex Kentucky offers something for everyone: the highest-level of equestrian competitors, tailgating, music, shopping, bourbon tastings, a 5K and, new this year, a performance by 5-time Grammy-nominated Hunter Hayes! Plus, your RK3DE ticket also gives you access to all Kentucky Horse Park attractions. This year’s Rolex Kentucky Three-Day Event is April 28th-May 1st. Tickets are available at www.RK3DE.org or by calling (859) 254-8123 and kids 12 and under are free. 1. 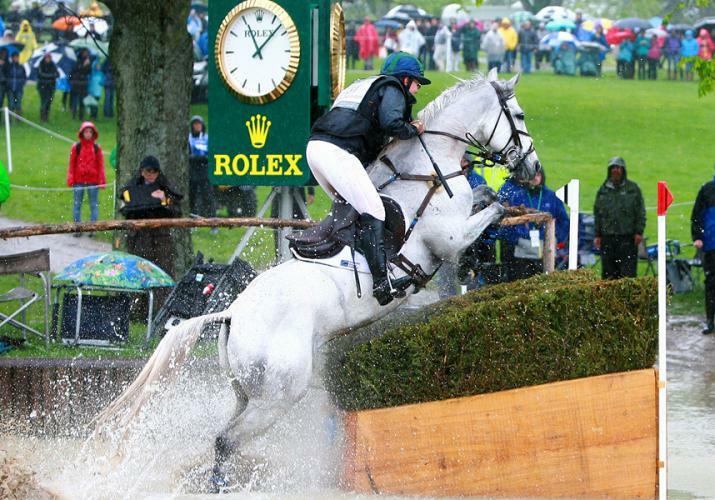 There’s no event like the Rolex Kentucky in the United States or this side of the globe! A qualifier for the Olympic Games and World Championships, Rolex Kentucky is a competition of the highest level on the international stage and one of only six annual Four-Star equestrian events in the world and the only one held in the Western Hemisphere. 2. Rolex Watch U.S.A. has been the title sponsor of the Rolex Kentucky for 36 years. In 1978, the then brand-new Kentucky Horse Park hosted the World Three-Day Event Championships, which has evolved into the Rolex Kentucky Three-Day Event. Rolex Watch U.S.A. came on as the title sponsor in 1981. 3. The competitors you’ll see compete at the Rolex Kentucky are the ones you’ll see on your TV screen during the Rio Olympics. Five of the world’s top 10 Eventing riders have already signed up to compete, including Michael Jung, ranked No. 1 in the world. Jung won double gold medals on his 30th birthday at the 2012 Olympic Games in London, making him the first event rider to hold the Olympic, World and European titles simultaneously. 4. The 2016 Rolex Kentucky Three-Day Event is an official trial for the 2016 U.S. Olympic Eventing team. This is your chance to cheer on your American Olympic hopefuls! 5. Known as the triathlon of equestrian sports, Eventing attracts only the toughest horse-and-rider pairs in the world! • Dressage (Thursday and Friday) An elegant demonstration of harmony between horse and rider as they perform prescribed movements that test the gaits, suppleness and obedience of the horse. • Cross-Country (Saturday) An exhilarating race that requires horse and rider to negotiate water hazards, banks and ditches. • Jumping (Sunday) A test of the competitors’ abilities to clear an in-door course of obstacles, where a rail can be knocked off by the slightest touch of a hoof. 6. Eventing is the only Olympic sport where men and women compete as equals. Plus there is no age distinction. This sport is just about the skill of a rider and his/her horse. And, the sport is open to any breed of horse – you’ll see multiple breeds compete at the Rolex Kentucky. In fact, many off-the-track thoroughbreds enjoy second careers in Eventing. 7. If nothing else, come for the shopping! The shopping at Rolex Kentucky is a once-a-year collection of world-class vendors that you won’t find anywhere else in the Bluegrass! ... as well as a shot at the $350,000 Rolex Grand Slam of Eventing, which is awarded to any rider who wins the Rolex Kentucky, Mitsubishi Motors Badminton and Land Rover Burghley Four Star Events in succession. The winner of the Rolex Kentucky wins $110,000, with the rest of the prize money distributed among the top 20 riders. Equestrian Events, Inc. (EEI), the organizer of the Rolex Kentucky Three-Day Event, is a nonprofit Kentucky corporation that seeks to ensure the competitiveness of the United States in international competition and to enhance the equine industry worldwide. EEI, which donates funds to multiple charitable organizations throughout the Commonwealth, is headquartered on the Kentucky Horse Park grounds. 10. Thoroughbred Aftercare Alliance (TAA) is the official charity of the 2016 Rolex Kentucky Three-Day Event. • Five-time Grammy Nominee Hunter Hayes will be performing Saturday evening (April 30th) at the Alltech Arena at the Kentucky Horse Park after the Cross-Country phase of the Rolex Kentucky. Tickets are $35 and a portion of the proceeds will benefit the U.S. Equestrian Team Foundation and TAA. Visit www.RK3DE.org for ticket information. • A very limited quantity of numbered Maker’s Mark commemorative bottles, featuring 2015 Rolex Kentucky Three-Day Event winner Michael Jung, will be auctioned off Thursday, April 28th, at a Rolex Kentucky fundraiser for Thoroughbred Aftercare Alliance at The Livery in Lexington. Tickets can be purchased www.RK3DE.org/bottle-fundraiser or by calling (859) 254-8123. • The RK-5K, the Twilight Run at the Rolex Kentucky, is a run/walk on Friday evening (April 29th) through the Kentucky Horse Park grounds; 5K participants also have an opportunity to contribute to TAA. • Volunteers from TAA will also be manning the bag-check booth throughout the event as a fund-raiser for their organization. Thoroughbred Aftercare Alliance (TAA), a Lexington-based, non-profit organization that accredits, inspects and awards grants to approved aftercare organizations to retire, retrain and rehome Thoroughbreds using industrywide funding, has been named the official charity of the 2016 Rolex Kentucky Three-Day Event Presented by Land Rover. The TAA supports 501(c)(3) charitable organizations across the country that retire, retrain and re-home Thoroughbreds. TAA has awarded almost $3.5 million to accredited organizations in the past two years and currently supports 56 accredited organizations across 180 facilities in the United States. Retired racehorses from TAA accredited organizations are re-homed every day and are retrained to be successful in Show Jumping, Dressage, Eventing, Combined Driving, Endurance and Polo, as well as Western disciplines, affording each of them the opportunity to have a second career. Accredited organizations supported by TAA include Kentucky organizations CANTER Kentucky, Kentucky Equine Humane Center, Maker’s Mark Secretariat Center, New Vocations Racehorse Adoption Program, Old Friends Thoroughbred Retirement, Our Mims Retirement Haven, Second Stride Inc., and The Exceller Fund, Inc. Each accredited organization is inspected by TAA and a team of veterinarians, and all must meet or exceed the requirements of operation, education, horse care management, facility standards, and services and adoption policies and protocol.